The next invention may be of interest to you if your government plans to build a carbon dioxide storage facility right where you live. Remember that CO2 is naturally present in air in a concentration of 0.04%, a concentration of 3% is uncomfortable and 4% is lethal. A low-tech early warning device is more than welcome. In a recent publication an Australian team with first author Darwish (DOI) describes one based on a solution containing a special dye. Bubble air through it and a specific color change will signal when to start run for it, just like with that coal mine canary. Here is how it works. The commercially available photochromic dye 1 was converted in two steps into amidine 4. In a methanol/water solvent the merocyanine zwitterion state 5 is more stable. The solution colors purple. 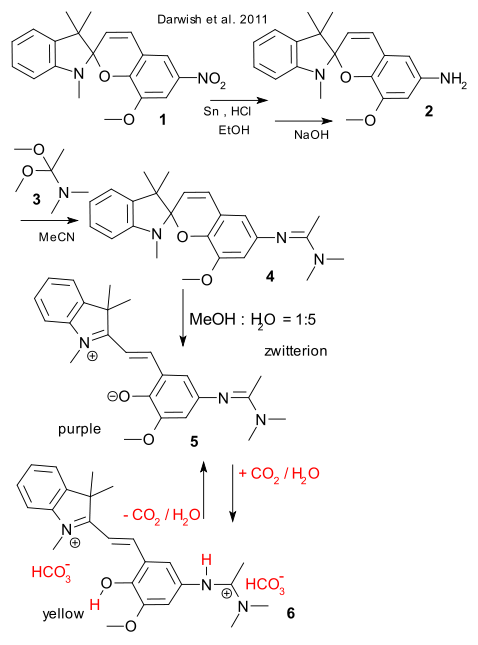 Adding carbon dioxide first forms carbonic acid which then protonates the phenolic group and also the amidine group to 6. A concentration of 1% CO2 is sufficient to color the solution yellow and this reaction is completely reversible. With respect to interference from other gases, sulfur dioxide is reported to spoil the system but not carbon monoxide.